TV NewsWatchers is the premiere source for local TV news monitoring in Pennsylvania and surrounding states. 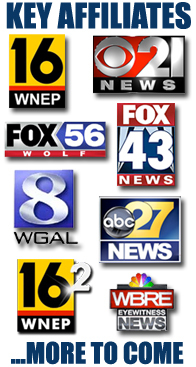 Through our partnership alliance with many TV stations in Pennsylvania and surrounding states, we maintain a permanent video archive file of all newscasts. In many cases we have access to video news clips as far back as 2004. Through an outsource cooperative arrangement we have access to local and national TV newscasts throughout the United States and Canada for up to 30 days from their original broadcast. A clip is 3 minutes or less in length. Each hit in a newscast represents 1 clip. Domestic (Family Related Matters: Kids in Sports, Graduations, Etc.) $45.00 EA. Commercial (Commercial or Organizational) $55.00 EA. Outsourcing (clips we have to purchase from another source) ADD. $25.00 EA. Legal Matters & Insurance Claims $85.00 EA. Copies from Your Master Disc $12.00 EA. Digitalizing After Purchase of Orginal DVD $60.00 EA. Streaming Video to Your Desktop After Purchase of Original DVD (Up TO 3 Minutes) $25.00 EA. Still Photos from Your Newsclips After Purchase of Original DVD $15.00 EA. Not long ago VHS tapes were the most popular way for people to preserve their home movies; Weddings, Baptisms, Graduations, Vacations and much more could be viewed right on our TV. These are all part of your family's history and should be preserved for future generations. VHS, however, degrades every time you play it. The color fades, the picture quality is lost then the tape becomes brittle and breaks.. This is why you should consider transferring your VHS to DVD now, before it is too late to preserve all that family history. It is great to share with your grand kids video of their grandparents and great grandparents when they were younger. Your videos are a link to the past that is in danger of being lost forever. Gather your VHS tapes and start preserving your precious memories today.